If you've been looking for a case mod that will strike fear into all the other computers you come across, well, look no further. But be careful, this guy gets cranky when he needs to defrag. A lot of us subject our computers to quite a bit of abuse. We overcrowd their hard drives and overclock their processors. We bang on their keyboards. We smudge their screens. 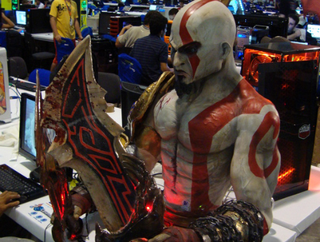 If you want a case mod that will keep you in line, this one, taking the form of Kratos, the main character from the God of War game series, will do just that.